Dodge Challenger v. Chevrolet Camaro - Which Muscle Car Is For You? You Are Here: Home > Dodge Challenger v. Chevrolet Camaro – Which Muscle Car Is For You? Dodge Challenger v. Chevrolet Camaro – Which Muscle Car Is For You? Dodge Challenger. That name says it all. Already, hearts are pounding and the “vroom VROOM” is buzzing in people’s ears. Maybe some imaginary flames in the background, too. 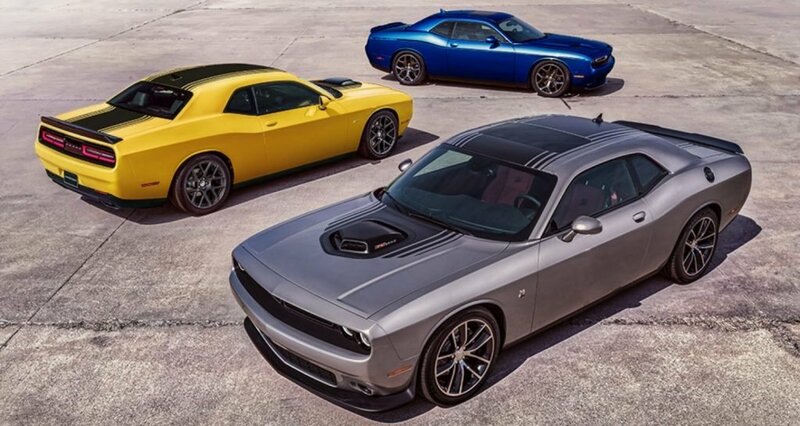 Dodge keeps on producing more and more powerful cars, and everyone wants to challenge the next big baddie. When it comes to the Dodge Challenger, what better challenge is there than the Chevrolet Camaro? Let’s see how it fares when facing the Challenger. Having debuted several new trims in the last year, the Dodge Challenger lineup has a total of 13 trims consumers can purchase right now, including the first ever all-wheel drive (AWD) muscle car, the Dodge Challenger GT AWD. The number of engine options on the lineup is almost as plentiful – there are a total of four, and the 6.2-liter supercharged HEMI V8 SRT Hellcat engine leads the pack. Generating 707-horsepower, the Hellcat accelerates from 0-60 mph in 3.6 seconds and can finish a quarter mile in 11.7 seconds. In addition to all that available power, suited with Uconnect as an available infotainment system, not only will any trim give the driver a sense of power and control, but they can also cruise the highway while listening to their favorite tunes. 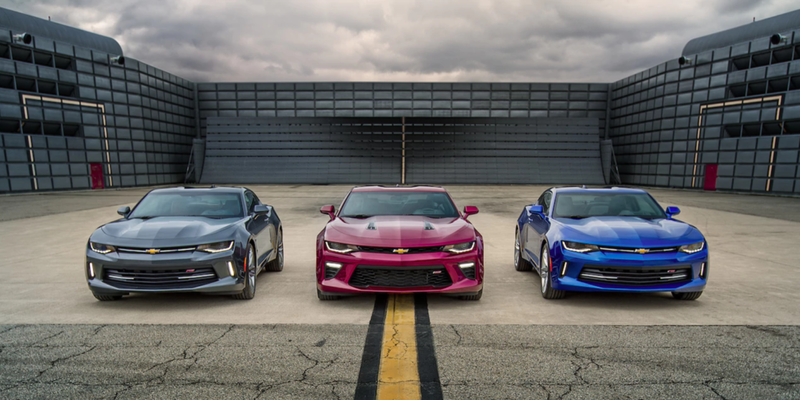 A worthy competitor to the Challenger, the Chevy Camaro has been heralded as one of the Chevrolet high-performance cars, right next to the Corvette. Available in five trims, consumers can get a Camaro as a coupe or a convertible. We’ll be looking at the coupe this round. There are three options available, the most powerful being a 6.2-liter V8 engine with direct fuel injection, generating 455-horsepower. The cars with the fastest engine, the SS trims, accelerate from 0-60 mph in 3.9 seconds and finish a quarter mile in 12.3 seconds. In addition, Chevrolet is well known for its Chevrolet MyLink infotainment system, already equipped with Apple CarPlay and Android Auto. It’s style is just as much of an icon of Chevy as the Challenger is of Dodge. There is one bump here that makes the comparison a little difficult. The 2017 Dodge Challenger is available with a great set of standard and/or optional features, whereas Chevrolet leaves many of the interior and exterior options up to the consumer to help them customize their ride. Here is a quick look at the standard equipment on both models. The 2017 Dodge Challenger comes standard with automatic projector headlamps, LED split taillamps, an auto-dimming rearview mirror, heated exterior mirrors, a rear window defroster, a satin chrome grille, solar control glass, and consumers can choose from thirteen paint colors. Exterior features available on select trims consist of a satin black painted hood, illuminated air-catcher headlamps, a functional hood scoop, a satin black rear spoiler, a shaker hood by Mopar, and various graphics and decals respective of the trim. The Challenger is available from the factory with 18-, 19- or 20-inch wheels with various designs. Standard on the 2017 Chevrolet Camaro is LED daytime running lamps, power-adjustable body-color exterior mirrors (heated on 2SS), high-intensity discharge headlamps with LED lights (upper-level trims), a memory package (2SS), and a spoiler (1SS and 2SS). Aside from windshield wipers and 18- or 20-inch wheels, other equipment options are left to the the consumer. The interior has a little more standard features laid out for the Camaro. But first, here are the available and standard features for the Dodge Challenger: it seats five people, has a 60/40 rear split-folding seat, premium cloth seating trim, a 7-inch reconfigurable cluster, dual zone automatic temperature control, front and rear solar control glass, a leather trimmed steering wheel and shift knob, premium front and rear floor mats, and has up to four solid color or color combinations for the interior. Available features depending on the trim are a media hub with USB and auxiliary ports, Apple CarPlay and Google Android Auto (USB Flip), a power sunroof, a leather performance steering wheel, a SRT instrument panel, a heated steering wheel, GPS antenna input, ventilated front seats, red seat belts, and leather trim and Nappa leather/Alcantara suede seating trim options. There’s a lot available, and all the information is laid out for the consumer. On the Chevrolet Camaro, the standard features stand out a little more. Aside from its four-passenger capacity, it has: single zone automatic climate control (dual zone on the 2LT, 2SS, and 2LT), a color display driver information center, a rear window defogger, keyless open and start, a leather-wrapped shift knob, a rear vision camera, cloth seats, and a leather wrapped steering wheel. Available on select trims is an enhanced driver information center, heads-up display, and heated front seats. Consumers can also choose from several convenience and comfort packages. Both vehicles have a lot to offer when it comes to technology. The standard tech features on the 2017 Dodge Challenger are a 5.0-inch touchscreen, a 6-speaker system, integrated voice command with Bluetooth, steering wheel mounted audio controls, and FCA’s infotainment system – Uconnect (5.0 standard). Available features consist of a premium 6-speaker system, a 9-speaker with a subwoofer, or an 18-speaker premium audio system with a subwoofer. Buyers can also opt in for a five-year SiriusXM Traffic and Travel Link service, 1-year subscription to SiriusXM Radio, an 8.4-inch touchscreen, Dodge Performance Pages, GPS navigation, HD Radio, and Uconnect 4C with an 8.4-inch display and/or navigation. Standard tech on the Camaro is a 6-speaker audio system, OnStar and SiriusXM Satellite Radio, Bluetooth for the phone, Chevrolet MyLink with a 7-inch color touchscreen, a media hub with USB and auxiliary ports, and electronic cruise control. Available features are a Bose premium audio system, Chevrolet MyLink with an 8-inch color touchscreen and/or navigation, and wireless charging. Again, there are select packages for upping the ante to look into. When it comes to safety, Dodge takes care of all of the basics, and this year they added a few automatic advanced features. The 2017 Dodge Challenger has active head restraints, an advanced multistage front airbag system, traction and stability control systems, keyless enter ‘n go, remote proximity keyless entry, a security alarm, and a Sentry key theft deterrent system. Available and advanced safety features consist of advanced SRT multistage airbags, blind spot and rear cross path detection, forward collision warning, ParkSense rear park assist system, and a ParkView rear back-up camera. All 2017 Dodge Challenger models have a basic limited warranty of 3 years or 36,000 miles, a limited powertrain warranty for 5 years or 60,000 miles, and roadside assistance and rust-through coverage for 5 years or 60,000 miles. On the 2017 Chevrolet Camaro, there is a dual-stage frontal airbag system, a LATCH anchor system for LATCH child seats, many OnStar plans (OnStar basic for 5 years and Guidance for 3 months, OnStar Automatic Crash Response, OnStar Crisis Assist, and more), and stability and traction control systems. Available advanced safety features consist of a battery protection package, rear cross traffic alert, rear park assist, a remote vehicle starter system, side blind zone alert with lane change alert, and teen driver mode. All 2017 Chevrolet vehicles are covered by a 3-year/36,000-mile bumper-to-bumper warranty, a 3-year/36,000-mile corrosion warranty, a 6-year/100,000-mile rust-through warranty, a 5-year/60,000-mile powertrain warranty, a 2-year scheduled maintenance plan, and roadside assistance with courtesy transportation for 5 years or 60,000 miles. Have the features on the Dodge Challenger enticed you? Check out or inventory for yours.